Niels was born to a Danish mother and American father, but grew up moving between three different continents. After coming to the UK, he completed his medical degree at the University of Bristol in 2015. While working as a junior doctor in the NHS, the benefits that artificial intelligence could bring to medicine were clear, but it was also evident that current systems were still too limited to truly transform clinical practice. During his medical studies he was passionate about neuroscience, and reviewed the capabilities of computer models used to study complex psychiatric syndromes such as schizophrenia. He also undertook online courses in programming during the evening, and in 2013 co-founded an award winning and profitable software startup that distributes a biomedical plug-in to spellcheckers and speech recognition software (Medincle Ltd, the website of which can be found here). 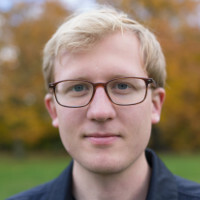 Keen to expand and apply an interdisciplinary knowledge to improve our computational understanding of the brain and its applications to artificial intelligence, Niels left clinical practice to pursue a DPhil in 2017 through Oxford's Interdisciplinary Biosciences Doctoral Training Partnership. Miscellaneous fact: Niels Leadholm is distantly related to the legendary Swedish footballer Nils Liedholm! Each moment, our visual system effortlessly constructs a representation of the world, with understanding at every spatial scale. Looking around a room, we perceive the furniture as whole objects, with all their sub-components, down to the very grain and imperfections in the wood. It is generally held that these different features, such as the presence of a table-leg, and the texture of oak wood, are processed and represented by different neurons or assemblies of neurons. How our brain is therefore able to correctly combine these visual features together, which could be as simple as object shape and colour, is known as the binding problem. In contrast to the rich representations our brain develops through binding, deep learning systems capture only rudimentary visual information. Niels is currently exploring a theory by which neural networks can learn and represent binding information, and the potential significance of this for machine vision applications.